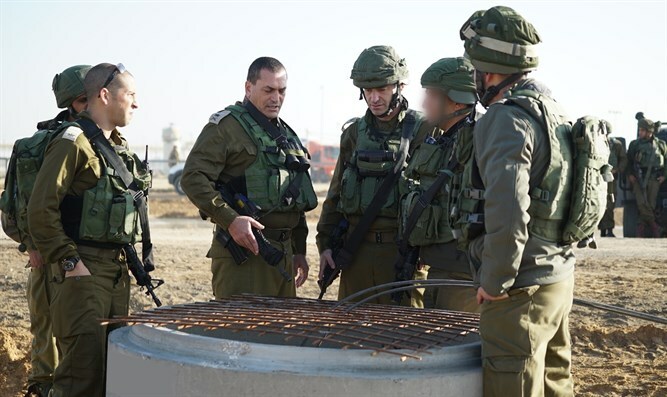 Major General Eyal Zamir visits tunnel site and praises forces in the field 'for precise action to thwart tunnel'. Major General Eyal Zamir, commander of IDF Southern Command, visited the site of the terrorist tunnel at Kerem Shalom this morning. Later, the Commander met the head of Eshkol Regional Council, Mr. Gadi Yarkoni, and briefed him on the tunnel's discovery. During the visit, the general said, "I expressed my appreciation to the Gaza Division, the Southern Brigade, and all forces from all branches for their precise action to thwart the tunnel. "The terror tunnel that traversed the Kerem Shalom crossing harms first and foremost the residents of the Gaza Strip," Zamir added. "We are determined to continue the effort to thwart terror tunnels and to act in any way to defend the residents of the Gaza vicinity and the State of Israel," added the general. The IDF says with certainty that the tunnel belonged to Hamas. The tunnel started in the Rafiah area 900 meters (2,953 feet) into Gaza and extended 180 meters (591 feet) into Israel. It passed under the gas pipeline between Egypt and Gaza.